Solstice Wood Fire Cafe – This was our first time crossing the river into Bingen, WA to try some food. Wow, it was worth the $1 toll bridge fee to get over there, plus what a great view of Mt. Hood. UPDATE: Solstice has moved across the river into Hood River. They are located on the Riverfront. The food is wood fired, even the dessert. They are known for their pizza. 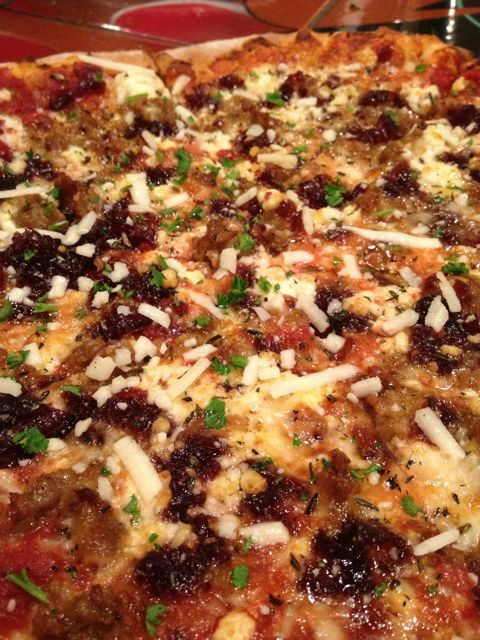 As a matter of fact the pizza we order and loved was voted as the best pizza in Washington State. We ended up talking with owner, even before we realized it was the owner. He is such a great guy. They are doing to crazy good things here. My favorite by far is they offer Date Night every Thursday night with free babysitting. I am a huge fan of dating your spouse and I love that they see the value as well. Keep up the good work Solstice. 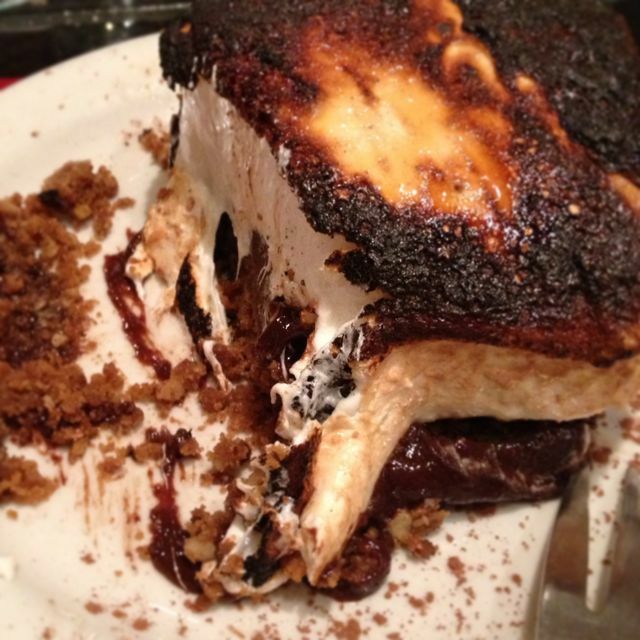 House made S’more at Solstice. 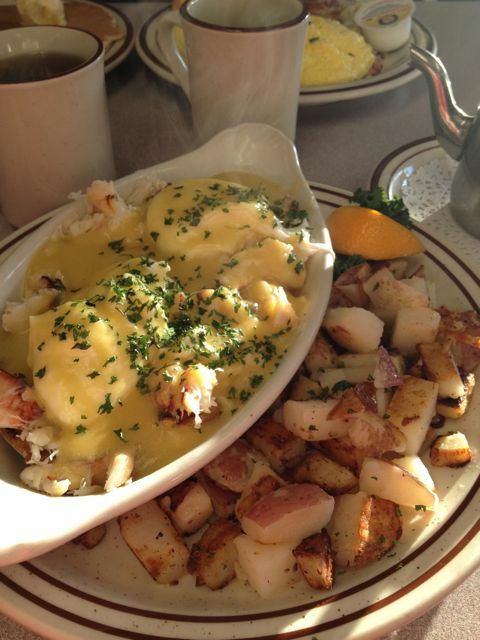 Bette’s Place – This place is always packed, and it always has great reviews. Not only that but it was recently recommended as a place to try. So even though it looks exactly like a diner, which I avoid, we gave it a try. The food was good. I got the eggs benedicts. They were very large and super filling. The service was great. My only complaint would be that it was very, very expensive. Each dish was $13.95. I also felt like it wasn’t gourmet or super special, but that’s not their thing, they are a diner, doing great diner food, which is not my thing. Eggs Benedict from Betty’s Place. 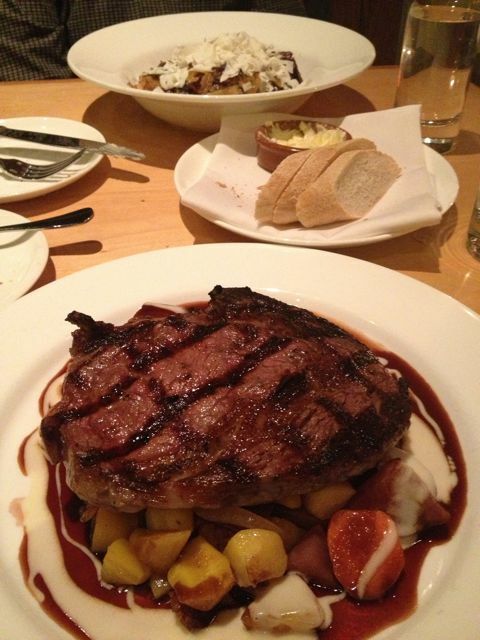 3 Rivers Grill – It’s hard to go to Hood River without a stop here. You can read all about it in my previous review. We stopped for the Fish Wrap, as always. We also love the view, even on a gloomy day, it’s nice because it’s so light and bright and open. 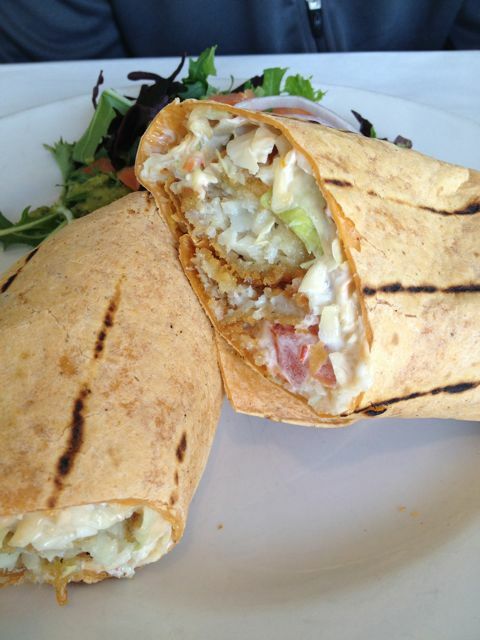 Fish Wrap from 3 Rivers Grill. Always a favorite. Celilo – This is probably our most favorite place to eat in Hood River. The food is always, always spectacular. It’s always different depending on the seasons. There is an element of surprise because you really never know what you will order. This specific day I ordered the steak. My husband was floored because I NEVER order steak. I make a good one at home, so rarely order it out. I just loved the way they were preparing it and presenting it. I was right, it was perfect, slightly unique and fabulous. My husband got the Pork Tagliatelle, which was really good. I can’t say enough about this place. Nora’s Table – This place is another one of our favorite places to eat. I was so excited to hear that they started serving breakfast on the weekends. We have talked to the owner/chef briefly before and stopped again after our meal to tell her great job. She is creative, inventive and her dishes are spot on. I had the Louisiana Eggs Benedicts with Cajun hollandaise sauce. She had a ham on there that she brines and smokes, so the flavor of the ham is like nothing you have ever tasted. It’s a Tazzo ham and it was first time I ever had it. It was spectacular. One of the best eggs benedicts I have had, and I’ve had a lot. 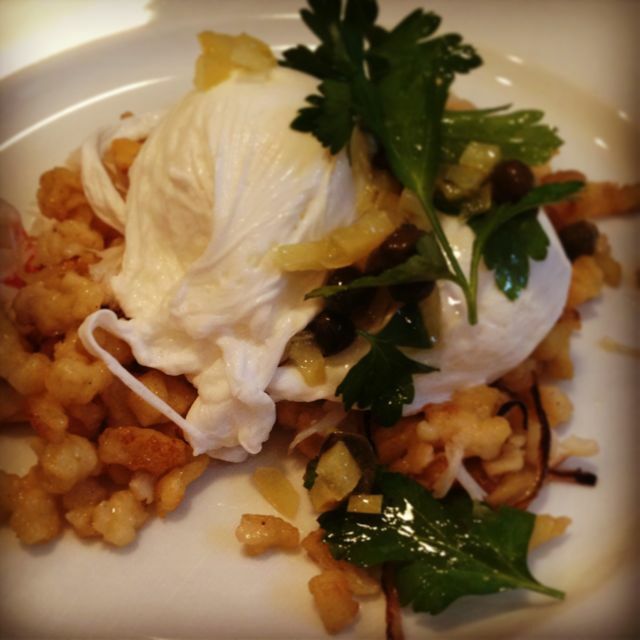 My husband got the spaetzle with poached eggs. We shared both dishes since they were really different and so good. Best part is each dish was only $10. This place is such a great breakfast place. One time we were staying at a B&B and it included breakfast. We ate small just so we could do a second breakfast a few hours later at Nora’s Table. Dinner is just as good. 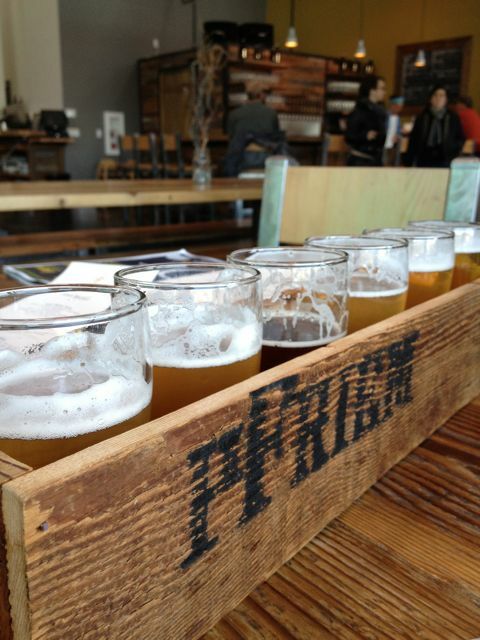 Pfeim brewery – There is a new area being devoloped on the river front in Hood River and this brewery has landed in one of the new spaces. You walk into this great dinning area that opens right up to the full on brewery. You can see it all. We just went for the beer, not the food. They brew Belgian style beers. They have at least 10 beers and you can can purchase a sampler with 6 samples and you get to choose your own samples. Love that. I tried some I was unsure of, but in the end I was pleasantly surprised by all the beers I chose. Wow, we will be back to grab some grub and full beers again. We stay in downtown Hood River, so this place, although a bit of a walk, is easy to walk to. Kind of makes you feel like you can eat more if you are working it off right away. We somehow didn’t manage to hit any coffee shops this time. Our days were filled with walks, hikes and even some downtime. Every time we leave we talk about what we will do when we come back. 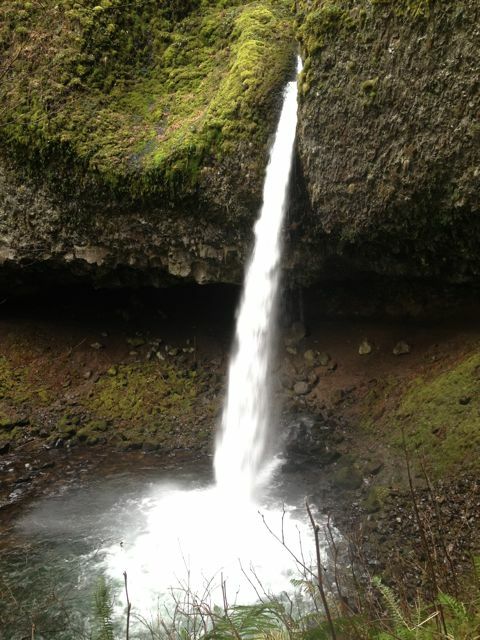 Here are a few of our other favorites in Hood River. It’s hard to hit them all when we visit and with new places opening. We might just need to visit more often.